or go to Organization > Exchange > Public Folders. Click Create New Public Folder. 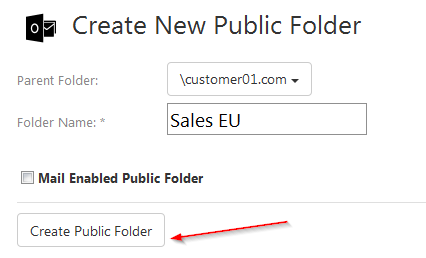 Select parent folder from the drop-down menu, type in the new folder name (mandatory), and click Create Public Folder. Mail-enabling a public folder allows users to post to the public folder by sending an email message to it. If you check this box, you will need to enter email address and then click Create Public Folder. Done! You have a new public folder. Check out how you can change settings for it.